It can be painful, or better put, discomforting, to clean the stairs with your standard vacuum cleaner. So, to make your life more comfortable and less frustrating, we suggest you continue reading this article, for it deals with the subject of vacuum cleaners for stairs. Not only will we present you our top 5 picks, but we will also provide you with our Value section, where we’ll explain the reasoning behind our picks and discuss the values according to which we chose our picks. The sole purpose of this article is to help you find the best vacuum for stairs, thus transforming dull stair cleaning into an easy household chore. Which One Should I Buy (If Any)? 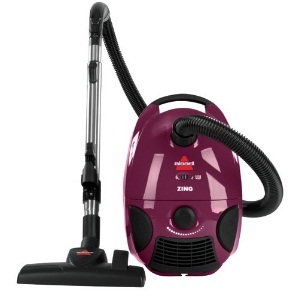 Last but not least is the 9595A, third Bissell vacuum cleaner on our list (and also the best, IMO). The product features advanced, OnePass brush design, which ensures rapid and efficient vacuuming. It isn’t the lightest product on our list but is excellent for stair vacuuming, thanks to the included TurboBrush tool. The dust canister is easy to remove and clean, making the maintenance less stressful. Suction is very potent, featuring cyclonic suctioning. The OnePass brushing is quite innovative, perfect for carpet cleaning. You also receive crevice tool, dusting brush, extension wand (for those hard to reach spots), and other devices. Filtration is excellent, multi-leveled, and also includes tank foam filter. We do commend the multi-cyclonic system, which separates heavy debris from fine dust, thus making the filter’s job a lot easier (and also prolongs the longevity of the filters). Naturally, we love the TurboBrush tool, which makes stair, car, and upholstery cleaning very straightforward. When it comes to suction, it is the strongest unit on the list. But, I don’t like the longitude or the stiffness of the hose. It won’t bother you when you clean in so-called upright mode, but when you are cleaning ceilings or upholstery, you might struggle a bit. Value for money, by far the most cost-effective, value for money unit on the list. Comes with useful mods (I love the TurboBrush tool). Suctioning power is unmatched, and doesn’t fade away over time. OneBrush design + multi-cyclonic systems deliver efficient vacuuming. The hose should have been either longer or a bit more elastic/flexible. Struggles with vacuuming pet hair. HOOVER Deluxe carpet washer (fh50150) is here to spice up the article: it is by far the most popular item on our list, perhaps even the most popular carpet washer on the market So, what makes it so good? For starters, the product features highly effective, 360-degree brushing system, also known as the SpinScrub technology. Once you fire it up, the brushes rotate, always in touch with the carpet, making sure that every grain of matter is collected. The brushes are removable, which makes them very easy to clean. It also features DualV nozzle, which distributes the suction evenly and consistently. Note that this unit is a washer: you have wash mode, which helps you clean the carpets (with water and soap), and rinse method, which enables you to clean the wash away the soap. And you don’t have to mix the detergent with water; the vacuum will do that for you. The cord is 20 ft long, and the hose is 8 ft long. Though this washer isn’t as light or as portable as others on the list, it comes with a lot of useful attachments which make cleaning a lot more comfortable. For example, you will receive a stair tool, which helps you clean the stairs rapidly and comfortably. Arguably the most sophisticated product on our list. Trendy item, preferred by thousands and thousands of customers. Comes with several attachments, including the stair toolkit. Technology-driven (SpinScrub, DualTank technology, etc.). Not as compact, portable and lightweight as others on the list. Not so friendly customer service. The Bissell 4122 Zing Bagged is a bit heavier than the previous two items but is still good for above the floor cleaning, as well as for bare floor and carpets. It is portable, featuring a comfortable handle, which inspires comfort and convenience. The nozzle features multi-surface design, suitable for cleaning bare floors, rugs, carpets, and so forth. The handle is adjustable (telescoping), helping you reach those hard to get areas, such as ceilings and corners. The cord is 18 ft long, and winds automatically in the dedicated cord storage. It is a bagged cleaner, which means that you’ll dispose of/replace the bag once it is near its full capacity (more on this in the value section). All in all, the Bissell Zing Bagged is powerful canister vacuum cleaner, lightweight and portable, excellent for cleaning stairs and open spaces. It is highly durable, inexpensive, with suction volume control, adjustable handle, on/off carpet brush, and many other features. Though there are some small technical issues regarding this vacuum cleaner, our biggest concern is the expensiveness of the dust bags. The vacuum cleaner itself is not expensive. Surprisingly lightweight for a canister cleaner. It comes with various mods and attachments. The dust bags are somewhat expensive. The powerhead could have been thinner. The Cleanview Deluxe is our second handheld vacuum cleaner. It is the lightest vacuum on our list, which is very important: a lightweight vacuum is an excellent tool for stairs cleaning. Why? For starters, it is inexpensive. It is also very lightweight, compact and portable, but surprisingly powerful vacuum cleaner. The handle is comfortable, ergonomically designed (curved), featuring on/off switch at the end. The item has 18 ft long cord. Dust canister is sturdy, reasonably easy to empty. The vacuum features multi-filtration system, which helps people who struggle with dust and allergies. The product features contour nozzle and comes with compatible nozzle adapter for all-around surface cleaning. Upon purchase, you also receive a crevice tool. Airflow is terrific, going through the 2 ft hose, and then through the multiple filter barriers. And the brush is of high quality, which makes cleaning more efficient. It is worth mentioning that the filters are HEPA-friendly. This could be an excellent vacuum for pet hair. The only problem we have with this cleaner is the exhaust vents, which are integrated on the sides of the vacuum cleaner; it takes some time getting used to this system. Other than that, we have no complaints. Excellent vacuum for cleaning pet hair. The lightest product on our list, perfect for cleaning your stairs. Inexpensive, well worth the price. It will take you some time getting used to the side exhaust vent build. The hose is somewhat stiff. 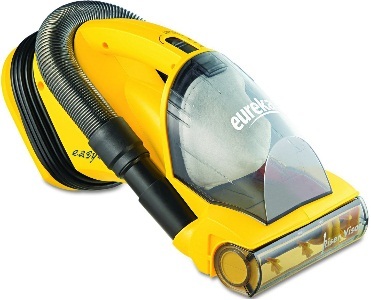 The first product on our list comes from the respectable vacuum cleaner manufacturer, Eureka. Here we are going to talk about Eureka EasyClean Hand-held 71B vacuum cleaner. Their EasyClean, handheld vacuum is inexpensive, lightweight, and portable, which makes it ideal for stairs cleaning. Though tiny, this vacuum is very powerful. Suction is stable and efficient, thanks to the on-demand on/off the motorized brush, which you can use based on the surface you are cleaning. The vacuum also features built-in filter, which comes with easy to maintain dust tray. The suctioning efficiency comes from the two motors: one motor powers the brush, and one suction. This, in turn, ensures that vacuum has enough strength to collect the dust but also to process it all the way through the tube, filter, and to the dust canister. The cord is 20 ft long, which makes the stair and vehicle cleaning more convenient. The product is handy, ideal for cleaning stairs and upholstery, due to its compactness and adjustability. However, it wasn’t built to last. It struggles with overheating, and the brushes lose their substance after a few cycles. It works great, but it is a shame that Eureka didn’t invest a bit more money into the durability; then again, the product would probably be more expensive than it is now. Inexpensive, well worth the money. 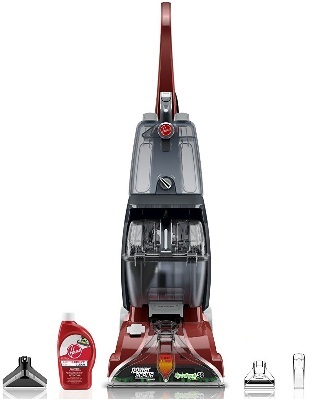 Two motor system ensures efficient cleaning. The long cord helps with stair and vehicle cleaning. Not that durable (it overheats after extensive use, and the brushes deteriorate over time). It should have been less loud. In this section, we would like to discuss the most important things related to the vacuum cleaners for stairs. 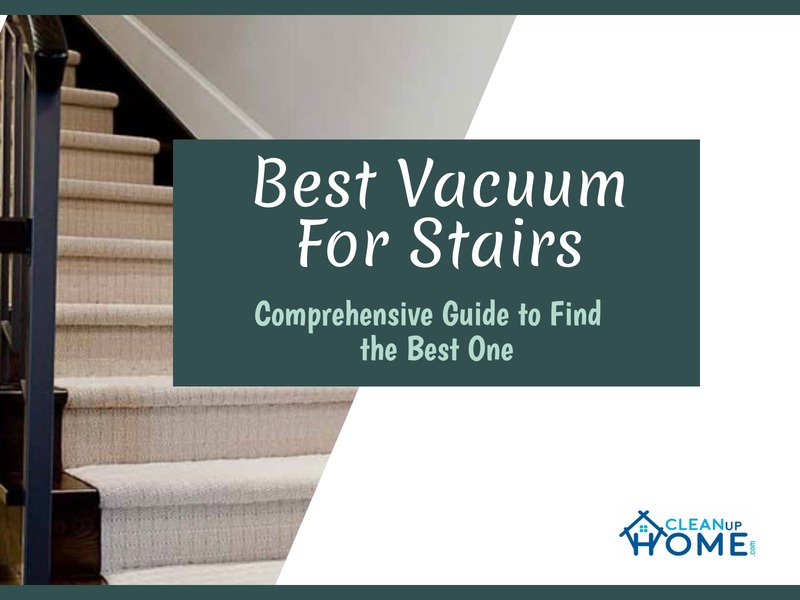 We suggest you go through this section with attention and care, for it will help you select the best vacuum for stairs. First and foremost, there are no stair vacuum cleaners. There are handheld, canister, and upright vacuums (see Wiki), but no stair vacuum cleaners. However, that doesn’t mean that some vacuum cleaners aren’t more efficient than others when it comes to stair vacuuming, upholstery vacuuming, open space vacuuming, and so forth. The right question is: what qualifies as good vacuum cleaner for stairs? Well, here are some of the things that come to my mind. It makes sense, right? As you move up and down the stairs, you don’t want to drag with you an old 30-pound vacuum cleaner. You want compact, and preferably lightweight vacuums, ones that will make the task less stressful, not more irritating. When it comes to portability, nothing beats handheld cleaners. They are small, light, and if you find the right one, surprisingly powerful. 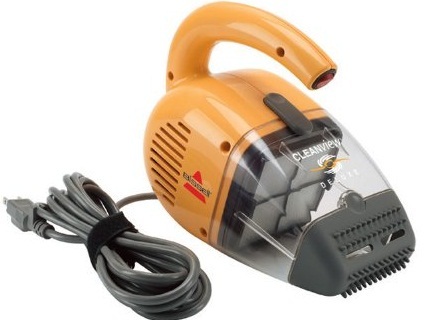 Such vacuums are also suitable for cleaning vehicles, furniture, and so forth. On the other hand, upright or canister vacuum cleaners generally have a long hose, attachments suitable for stair vacuuming, etc. Naturally, they are heavier and bulkier, but are much more versatile, meaning that you can clean open spaces with them more comfortable than you would with handheld cleaner. Usually, I wouldn’t say that cord length is something you should pay attention to when you are looking for a vacuum cleaner. But, when it comes to cleaning the stairs, you have to consider it. Now cord length isn’t vital (by default), but it can be. For instance, if you have very long stairs, the short cord can cause headaches. And I doubt you have a power socket halfway up the stairs. In any case, make sure you are satisfied with the cord length when you are selecting the product. Make sure that you are happy with the attachments that come with the product. For instance, what I like the most about Bissell 9595A Vacuum Cleaner is the TurboBrush, a tool used mainly for stair vacuuming. As I said previously, stair friendly (let’s call them like that) vacuum cleaners make stair vacuuming more comfortable than the standard vacuum cleaners. But, are they worth it? That’s entirely up to you. If you seek product for stair cleaning specifically, then go for the handheld cleaners. However, if you plan on using the vacuum cleaner for tasks other than stair cleaning then go for the more versatile ones. They all have advantages and disadvantages and differ in many fields. For instance, HOOVER Power Scrub Carpet Washer is much more durable, powerful and sophisticated than the Eureka EasyClean Vacuum Cleaner. On the other hand, Eureka EasyClean is four times lighter, less expensive and a lot more portable. In the end, it comes down to your preferences, your budget, and other things that can’t be objectively measured and written on the paper. There is a lot of content online regarding this subject (check WikiHow). You have opinions on the environment, health, functionality, cost-effectiveness, and so forth. For instance, WikiHow argues that one of the advantages of bagless vacuum cleaners is that, if you vacuum valuable items (such as jewelry), you might be able to retrieve those items as you are emptying the bag. As you can see, people go really far to say that something is better than something else. Don’t get me wrong, this is a valuable point, it is possible that you vacuum your wedding ring and then retrieve it while you are emptying the bag; but how probable is that scenario? What I’m trying to say is that, when you are selecting between bagged vacuums (which don’t have a built-in bag and instead use disposable bags) and bagless (which use built-in bags), focus on the things that might be important to you. If I had to pick one, I would go with the Bissell 9595A Vacuum Cleaner. It has a fantastic reputation and excellent performance. The product is versatile, and you can use it for cleaning stairs, upholstery, open space, and so forth. It comes with cool attachments, most importantly with TurboBrush, which makes stair vacuuming very simple. I see it as a balance between handheld and canister clears on our list: it isn’t the most portable one but has unique attachments, excellent durability, and great suctioning power. However, just because we like it, that doesn’t mean you should go for it. As always, pick the one according to your budget and your needs. Mind the cord length, bagged or bagless choice, and other small things that may help you narrow down the options.